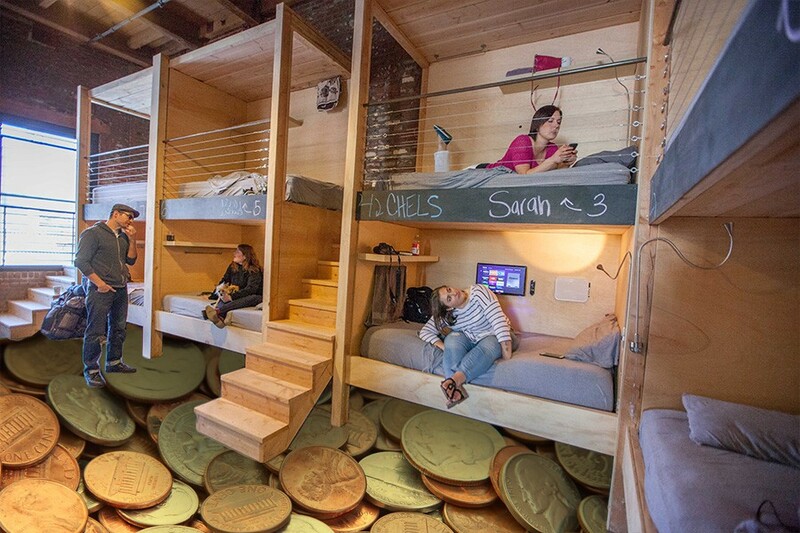 Is it worth $1,800 a month to live in a glorified youth hostel? PodShare isn’t a service; it’s a lifestyle. The most perplexing aspect to PodShare, though, is the price, which doesn’t make much financial sense in its current iteration (at least in the way that PodShare markets itself). PodShare founder Elvina Beck imagines the company becoming the first global “subscription housing” model, fundamentally changing how people view work and shelter, and allowing everyone to live like vagabonds at all times. “Imagine paying one monthly fee and living anywhere in the country, or maybe even the world,” she says in this BuzzFeed video. But until that day comes, it’s hard to see why a person would use PodShare for anything longer than a temporary stay. Currently, PodShare only has locations in L.A., making the “world traveler” idea moot. The newest location just happens to be right around the corner from the MEL office in Venice, where a twin bed goes for $60 a night, and a queen $80. There’s no price break for extended stays, so if I were to sleep in a twin bed for a month, something I haven’t done since I was 11 years old, it’d cost me $1,800, or about 1.5 times my monthly rent. A queen, which is far more suitable for a man my size, would be nearly double my rent. The DTLA, Hollywood and Los Feliz locations aren’t much better, with overnight stay prices ranging from $50 to $70. In fairness, though, that’s just me. Or more specifically, I’m fortunate enough to have relatively cheap rent for my one-bedroom apartment. The average monthly rent in L.A. is more than $2,600, according to Zillow — so definitely more than PodShare. But it’s all in what you’re paying for, too. For instance, in Venice, $1,800 could get you a “cozy” studio, and you can rent a decent one-bedroom apartment in the area for $2,300. They’re short on space, but infinitely more private than PodShare. PodShare is obviously for travelers, then, but there’s little financial argument for choosing it over Airbnb, where there are plenty of options to rent a private room in someone’s home for $2,000 or less per month. Bonus: You don’t have to sleep below your bunkmate’s farts. Communal living spaces are cheaper on Airbnb, too, where you can even find a Silicon Valley–style “hacker house” for $1,100 per month, or a live-work residence in Venice for less than $1,500. PodShare’s idea of offering worldwide access for a monthly fee, and turning life into one, endless Kerouacian adventure is an intriguing one. But until that idea is realized, it’s nothing more than a glorified hostel, a designation the founder actively resents.